It’s been a week since 53,034 people packed Adelaide Oval for the AFLW grand final and I’m ready to carry on with my list of the seven things I love about the sport. Before I launch into my list, I want to clarify that not everything I love about the AFLW is missing or defective in the AFL; it’s just different. To borrow from past Fremantle legend Lachie Neale, can I not say anything about my current club without it being about my former club? You can also read part one of my list here. All I really have to draw on for this point is the vibe, but I figure if the vibe is good enough for a senator to reference, then it’s good enough for an amateur footy writer. The AFLW community has its own unique vibe, and I love this point of difference. It’s hard to put my finger on what makes the AFLW community unique, so I’ve borrowed from The Castle again. The AFLW is sprinkled with a special seasoning that makes everyone feel like they’ve kicked a goal. Thank you, Sal Kerrigan. If you need something more tangible, I’ve also formed my opinion from the various AFLW-specific social media sites and there’s simply not the same problems there compared to general AFL and sporting sites. The closest thing I’ve seen to an offensive comment is when I wrote, “Shame you’ll have to eat those words, mate” in response to a post about Carlton coach Daniel Harford backing his girls in against Fremantle. The most antagonistic reply I got was, “No he won’t.” I mean, who gets let off that easily when it comes to footy talk! And, yes, I was the one eating my words after all. It was fortunate that Adelaide won against Carlton in the grand final, otherwise I’d be doubling up on that diet. Perhaps part of what makes the vibe of the AFLW community so appealing to me is its inclusivity. The AFL is of course inclusive, but I think the AFLW offers a safer space for inclusivity. 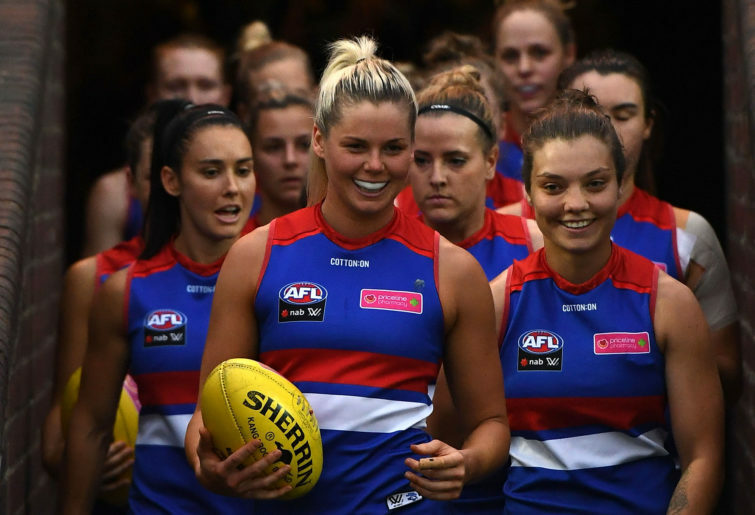 The now iconic Tayla Harris image is even more powerful considering she is wearing the specially designed jumper for the Bulldogs vs Blues AFLW pride game and a black armband in mourning for the Christchurch massacre. Not only is the pride game wholly embraced and celebrated, many clubs even have their own LGBTIQ supporter groups. Granted, the AFLW isn’t entirely inclusive, with trans women still unable to play, an aspect that requires further consideration, but I don’t think it’d be hard to imagine the kind of outraged and outrageous commentary if the AFL implemented a pride game. No, not the usual ‘footy and politics don’t mix’ commentary; the kind of commentary that leads to a Tayla Harris or Liam Ryan incident. While our female players shouldn’t have to go ten rounds of conditioning training for the cause of social change, it can’t be ignored that the backlash to the Tayla Harris photo has changed the social media conversation. Change the conversation, change the thinking. Before this article degenerates into a Q&A episode, I also want to point out how much I love player mentality. We’ve come a long way since the origins of the word hysteria (sorry, I’m channelling Tony Jones), and the mental resilience of the female players is extraordinary and inspiring. I’ve already mentioned Kiara Bowers’s tackling triumphs, but her achievements this season are even more impressive considering she was recruited by Fremantle as a marquee player in 2016 but didn’t hit the field until this year due to a knee reconstruction and further complications. She attributes her eventual return to a few ice-cream binges on bad days and always keeping the faith. “For me, it had been so long and there was a part of me that felt it was never going to happen but I knew I had to back myself,” she said. Former No. 1 pick Isabel Huntington also knows the struggles of returning to the game after an ACL injury, but she has a more unusual support network. Izzy belongs to an ‘ACL club’ that grew from chats she’d been having with other Melbourne-based players recovering from knee injuries. To finish this point, I have to mention Daniel Harford’s response to a question during the grand final that perfectly illustrates the women’s mental toughness. Yep, that’s me on my horn. Since writing my first instalment I’ve had a few female friends tell me that my enthusiasm for women’s footy this year has almost inspired them to follow the AFLW. High praise from individuals who consider witty repartee with baristas as close to any sport they’re ever going to participate in. So when I talk about accessibility I’m not talking about the free tickets or ample parking on Fremantle Oval’s doorstep; I’m talking about how easy it is to engage with the AFLW version of the game. I’ve always engaged with the AFL through club allegiance, the entertainment value of the sport and player personalities. I’m not a technician, a statistician or even a tactician, so I’ve often felt insecure entering into the AFL conversation. With the AFLW, however, I don’t feel like I have to know the numbers; I just need to know the people. When I’m not decluttering my trophy room, engaging with the AFLW in this manner is what I find joy in. I’m going to stick my neck out and hypothesise that if we were to track the demographics of attendees at AFLW matches compared to AFL matches, we’d find that they are very different, and perhaps it’s because the AFLW appears more accessible to those who weren’t born with an AFL club allegiance or who have never belonged to the inner sanctum. And with that we’ve reached the end of the seven things I love about the AFLW: physicality, personality, opportunity, community, inclusivity, mentality and accessibility. 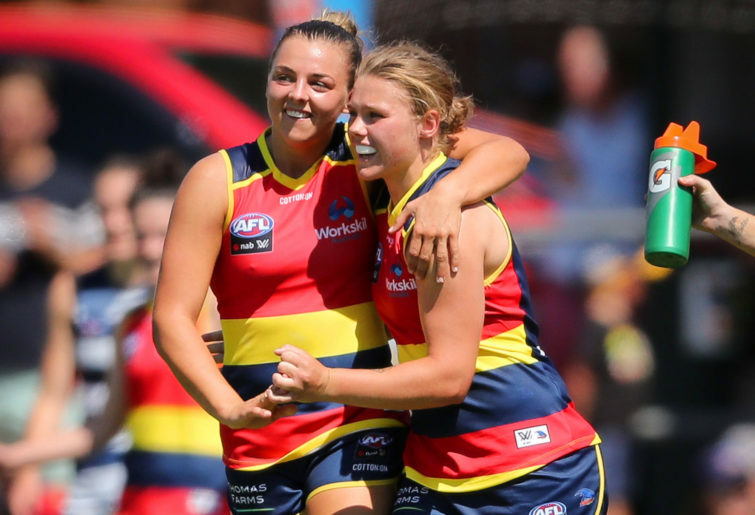 Sure, there’s plenty that still needs to be addressed – season length, the conference system and picks for new teams, to name a few – but I’m pretty damn happy with what the AFLW has managed to achieve in three years. When we get down to the nity gritty, there’s a lot to love.